It was with some difficulty that I roused myself at just past seven on Friday morning, May 1st. In much of Europe, the first of May is a holiday. Communist countries once celebrated May Day (Labor Day) religiously – “You had to have a really good reason not to show up to the parades,” Katka explained to me as we brushed our teeth through bleary eyes – and the day is still observed even if its origins have become obsolete. Katka and I were in Warsaw on the way to Ełk for the long weekend and a friend had put us up in his parent’s attic, which I quite liked. The whole house was lined with beautiful wood panelling, polished and smoothed like the inside of a doll house whose owner was rather keen on outdoors-y excursions and mountain cabins. The attic was spacious and quaintly prepared for our stay. Michał (pronounced “Mi-:flem sound:-ah-w”) watched, amused and pleased, as Katka and I oggled over the large bookshelf taking up nearly an entire wall of the loft. Titles that I know and love in English, and that she knows in Czech, were sitting before us in Polish. We cracked open Harry Potter to see just how different the language really is. Unsurprisingly, it’s very similar to Czech once you get a handle on the tags and tails of the letters, and I understood about forty percent of it (though it helps that I have the books practically memorized). Michał – who I called “Mikey” all weekend, for obvious reasons – is a bit of a surprise, not that I have many Poles to compare him to. He certainly looks the part of a Polish school boy, his long blond hair sweeping indecorously across his face and his flat, kind smile making him look properly yet modestly intellectual. He made us crepes for breakfast. After listening to some Polish radio, comparing the names of months on the kitchen calendar, and arguing about the validity of the American pancake, we piled into his car and drove into town. Even after our coffees, we were still feeling groggy and heavy-headed. Katka casually reminded me that if we had followed my original plan, we would have had to be on a bus already. I don’t tend to admit when I’m wrong, so I just sat in silence and stared at Mikey’s long-handle umbrella as Mozart blasted off his stereo speakers. The original plan was to get to the Polish lake region. 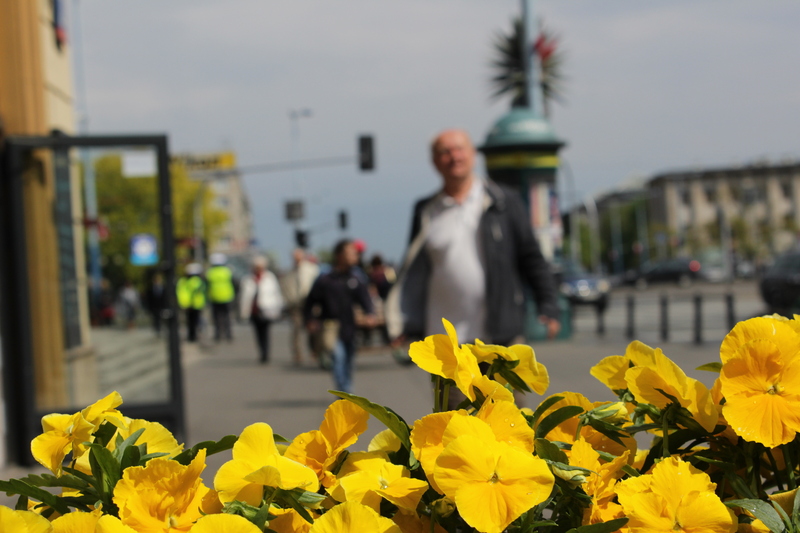 I’ve wanted to go for a while now – ever since my trip to Dublin when an Italian I shared a cab with spent the entire ride telling me about how gorgeous it is. A few internet searches later and I was hooked. It got shoved to the top of my bucket list. 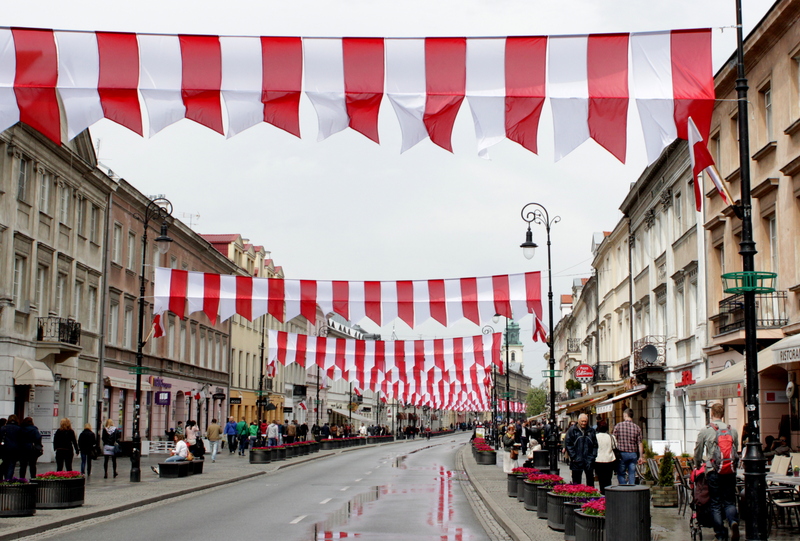 But getting to Ełk was proving to be a harder task than I figured. It’s a remote little town, five hours out of Warsaw. Mikey said he would help us figure out the transportation if I let him show us the park first, so I let myself enjoy an unexpected morning in Warsaw – already a thousand times better than trying to sleep off the a.m. hours on a bus. The roads were clear because of the holiday, but the sky brooded overhead threatening to give us a wet morning. 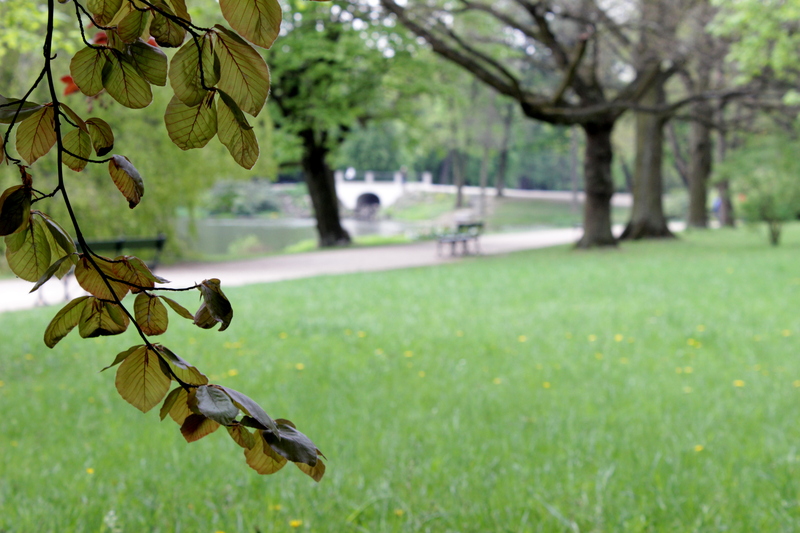 We parked the car and walked a few blocks over to Warsaw’s largest park. 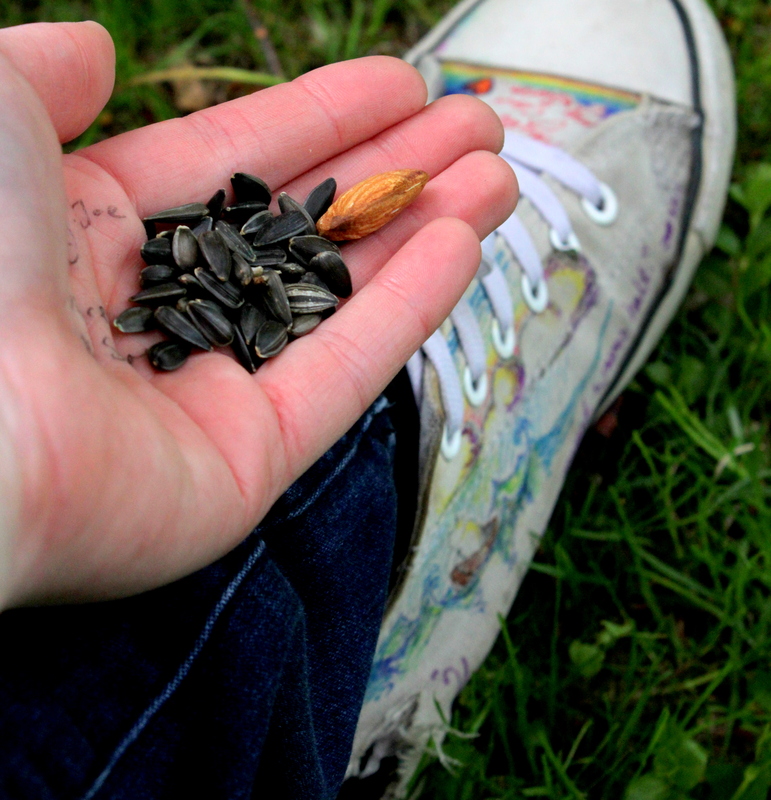 Mikey had brought with him a bag of almonds and sunflower seeds. 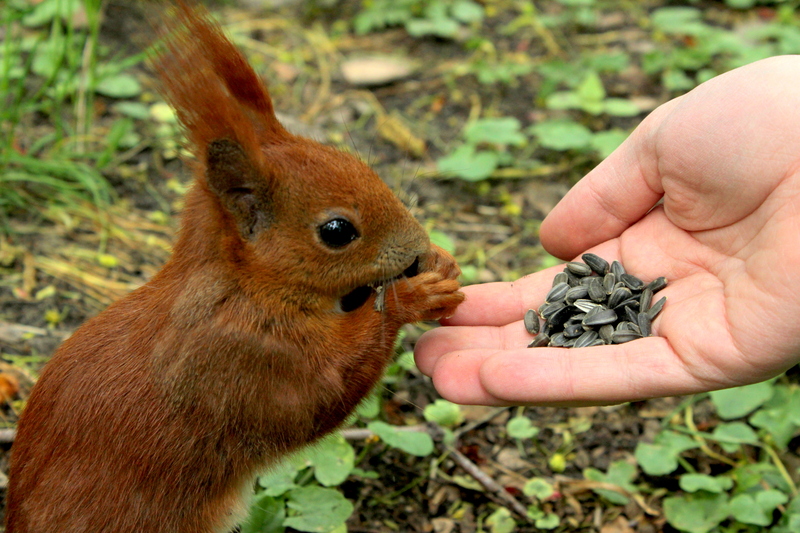 We were going to feed the squirrels, he told us. The plan didn’t quite register with me since feeding squirrels is not a common American pastime. A live orchestra could be heard from somewhere in the middle of the park, further pushing animals from my mind. The music flowed over us like the sunshine that was missing from our day. Ode to Joy was the first piece I recognized and it was followed by waltzes and polkas and marching band music. Katka and Mikey wanted to find the squirrels; I just followed the music. We wound through several tree-lined paths before Katka spotted a tawny flash of fur darting across the lawn. She and Mikey followed quickly with almonds outstretched. “Tursh, tursh, tursh,” Mikey encouraged the little squirrel who had stopped and was giving them quizzical looks. “Tursh, tursh,” he said again, egging him on. The squirrel scampered close enough to grab the nut from Mikey’s hand before running off to the nearest tree to eat his prize. But he was back in minutes. Again and again, he’d race up, grab the nut and then dash away to eat or bury it. As we moved through the park, towards the music, more squirrels came up to us. Some shyly, others with exceptional brass. “I love squirrels,” Katka said, spilling over with excitement. She was in her element, petting the orange balls of fuzz that would come up, hold her finger for a moment and then prance away with a nut locked between their teeth. They reminded me of myself in a small way – energetic, slightly psychotic, oddly adorable, and always appearing to be lost, confused or very deep in a shallow thought. “Let’s see if we can get a bird,” said Mikey. Song birds were flitting about through the trees, pigeons and ducks waddled around our feet, and somewhere far off we could hear the flat trill of a peacock. The birds took more effort. Coaxing them to leave their branches to scoop seeds out of the palms of our hands took patience and by this point we were so near the center of the park where the music was I decided to leave the birds to Katka and Mikey. A river (or a very expansive pond?) washed peacefully under bridges and far-reaching boughs of the deeply-green trees. 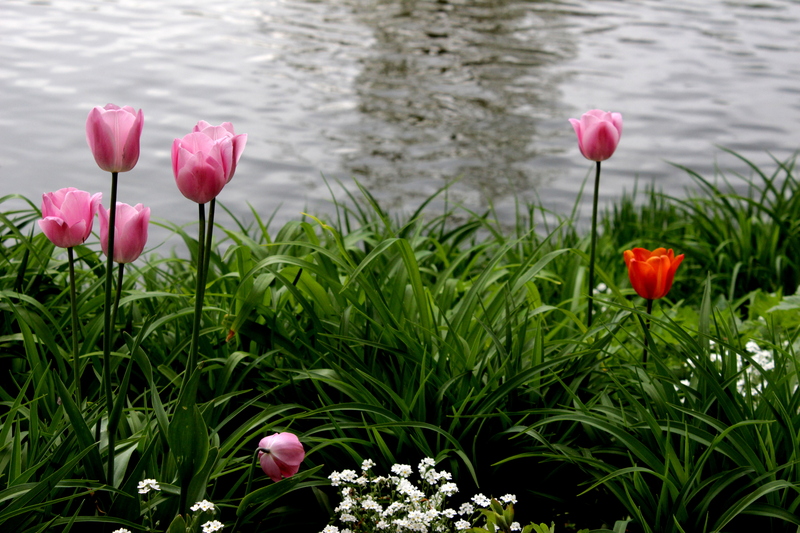 Tulips and spring flowers popped up along its edges and awning-covered paddle boats drifted across its sleepy waters. Now and then a rain drop would ripple its surface, but the sky was holding steadily. The orchestra was on a center piece in the middle of the river, opposite a white concrete amphitheater. A larger congregation of people had stopped to listen to the music and to buy waffles from a stand nearby. We found our peacock among them and suddenly the song birds were forgotten. Mikey and Katka had a new target. “I don’t know if we should try to feed him,” Mikey said. “He’s pretty big.” True. 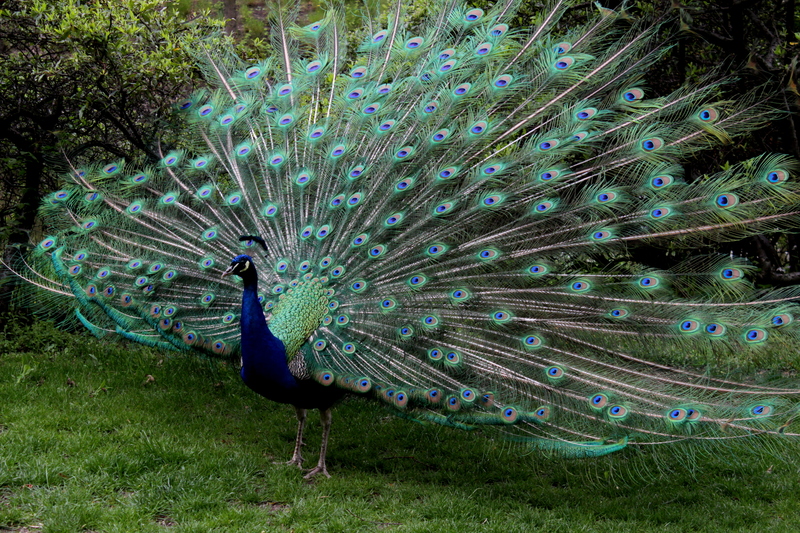 The ducks had been scary enough – I was fine just watching the arrogant bird puff and preen himself. Actually, I was fine just standing right where I was between the water and the music. While the others tried to get the proud peacock to cooperate with the camera and the bag of seeds, I meandered around the amphitheater. The banks of the river (pond?) were softly green and the water looked cold. My mind wandered to Ełk and its lakes. “We’d better start making our way back to the car if we want to catch your bus,” said Mikey, coming up behind me. Slowly, we ambled back through the park, stopping to hold out our hands hopefully to the song birds. 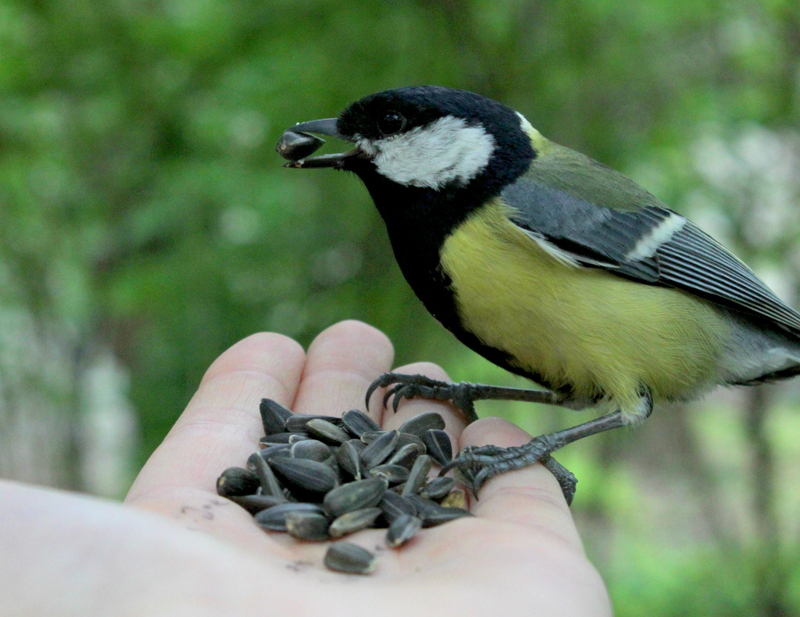 The squirrels followed us like hungry puppies but they had lost their novelty and we were saving our seeds for the chirpers. .
We found a thicket flush with the little singers and several dropped into our hands for the seeds we held out. Birds feel hollow, like there is nothing beneath their feathers. It’s an odd sensation to have one on your hand, its scratchy feet clinging to your finger for the briefest moment, before lifting off again. Suddenly, Katka let out a shriek of delight. There beneath the bristly green foliage was a tiny beige-colored mouse, poking its nose out of its hole. In a moment, the birds had been forgotten and Katka and Mikey could do nothing but try to coax this mouse out of its home. I kept wandering, towards the car, away from the music, looking for birds. It started raining right as we closed the car doors and the onslaught was unrelenting when we pulled into the bus station. The bus, unfortunately, was all booked and we couldn’t get tickets. The next one didn’t leave for two hours which would get us to Ełk much later in the evening. I bit my lip and put on a good face. (I’m learning to respond to situations I dislike in a grown-up fashion). We decided lunch was the next obvious move, so after procuring actual tickets for the bus at 2:30 we trotted off to Warsaw’s “Old Town” area. The day became gorgeous rather quickly. The sky opened up, dumping sunlight on us in heaps. Jackets came off, sunglasses came out, and I readjusted my camera settings to handle the light exposure. Bright red and white banners hung across the street and every puddle reflected brilliantly blue sky. The only down-side were my shoes which have a number of holes in the bottom and are missing several key pieces of material around the sides. I’d throw them away but (a.) I can’t really afford new ones right now and (b.) I spent quite some time drawing very intricate pictures on them. They’re basically artwork now. 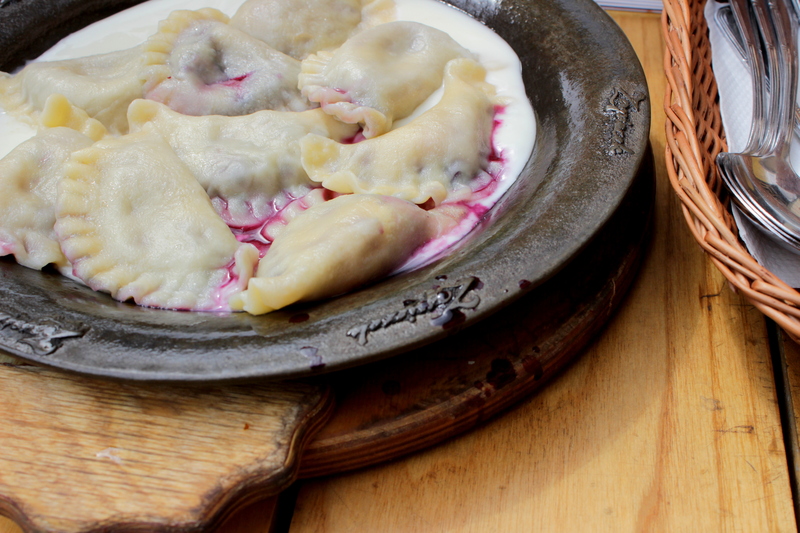 I sopped along behind Mikey and Katka in my soggy shoes until we reached the pierogi (stuffed Polish dumplings) restaurant. The patio opened onto the main street and our corner was closest to the intersection. The noise and colors kept our spirits up as we ate our lunch (which was phenomenal). But returning to the bus station was harder than we thought it would be, on account of getting lost multiple times in multiple ways (and I’m happy to say, not all of them were my fault this time). Long story-short, we raced into the station as the bus was pulling away. The next bus was at 5:30 and we wouldn’t get to Ełk until 10:30. Katka and Mikey were both visibly upset and verbalized their emotions in undertones and a few choice words I don’t allow in my classroom. We discussed options – staying in Warsaw, getting to Ełk in the middle of the night, going to a different lake town, going back to Prague. Frankly, I wanted to die. The prospect of spending my whole weekend in Warsaw was depressing. It’s nice enough to feed the squirrels and eat dumplings, but I wanted to see the lakes! That was the plan from the start! My two companions were distressed, so I suggested we find a place to get coffee, cool down and regroup. Because of the holiday most places were closed, but KFC (God bless U.S. hegemony) was open and had decent wifi. 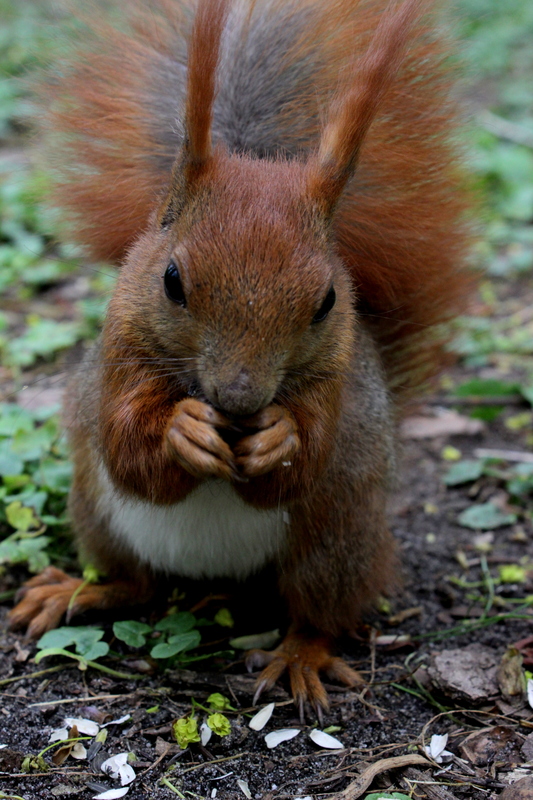 We called our hostel in Ełk, we booked tickets for the 5:30 bus, we looked at our squirrel pictures. It was only when I looked down to check the computer cord that I noticed my shoes. I knew they were wet still, but the sight made my stomach tighten. My beautiful pictures were smeared and and unrecognizable. This was a bit of a blow and I bit my bottom lip. Katka noticed and laughed at me. And that was it. Situation handled. I bought Katka and myself some chicken sandwiches for the road (knowing we’d need nutritional and emotional support during our long bus ride) and we returned to the bus station for a third time. “I feel like we’ve been here before,” said Mikey as he parked and turned off Johannes Brahms. We said proper ‘goodbyes’ this time and he pulled away in his smart little car as we headed into the station. We only had a half hour to wait and then we boarded the warm bus, taking our seats near the front. I was pretty proud of myself for surviving the day. I didn’t let the catastrophes and ruined plans affect my attitude. I didn’t stress out or become controlling. I didn’t have a single breakdown – not even over the shoes, technically. We were waiting for the bus to pull away and I reached in for our sandwiches. What I pulled out was a gooey lump of bread and mayonnaise. The cheese and meat had slid around and the juices had soaked through the buns, the paper wrappings, and the bag I had put them in. And worst of all, they looked as unappetizing as I felt unhappy. Changed plans. Missed buses. Ruined shoes. These things I could handle. But when I looked at how pathetic our sandwiches were – which I had bought with money I barely have, specifically as a treat to make us feel better after our long day – I burst into tears. Katka laughed at me again and suggested we take pictures and add them to Buzzfeed’s list of foods people cry over. It took me a couple seconds to realize that the tears had stopped and I was eating the sandwich. The meltdown I felt coming never did. I had moved on quickly. I had conquered another foe standing between me and adulthood. Life is like a walk in the park. We move from squirrels to peacocks to songbirds to mice, each new thing a challenge and an adventure. 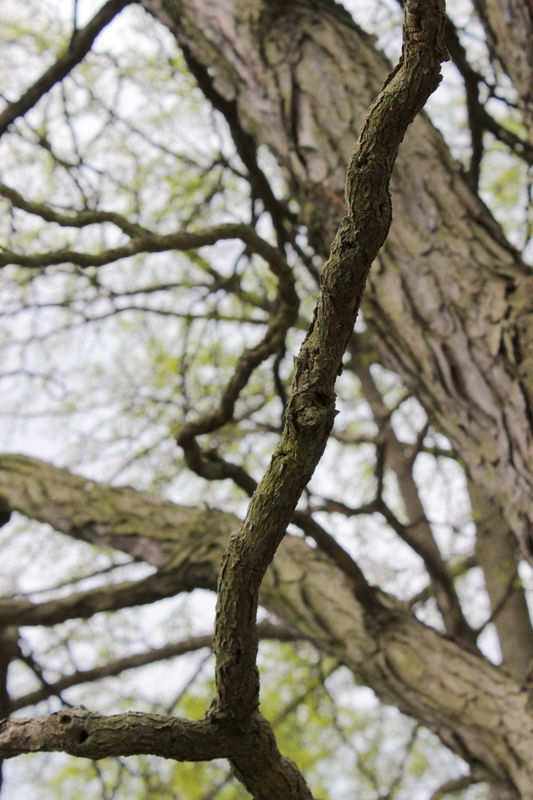 And eventually we move on from it, farther into the trees, closer to the music. The key with life is to realize when it’s time to make that move. The bus carried us through five hours of dark fields and forests. The whole time I thought about how much my walk in the park has changed in the last two years. 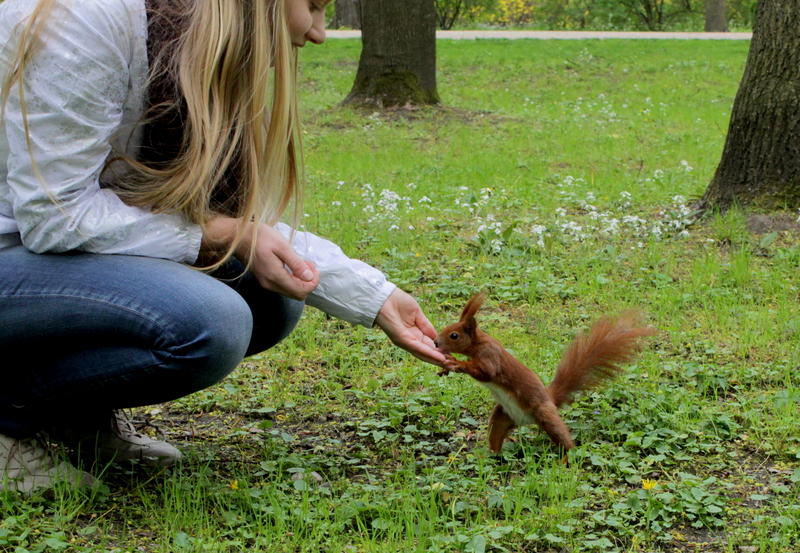 I definitely came to Prague in squirrel-phase. But you know what? I think I’m a bird person now. This entry was tagged adventure, dumplings, Europe, exapt, Ełk, friends, life, missing buses, park, pierogi, Poland, squirrels, travel, Warsaw. Bookmark the permalink.